I’m so proud that this piece was chosen for theBirds in Art US tour. From the 99 original entries chosen for the exhibition, 60 are chosen for the US tour. 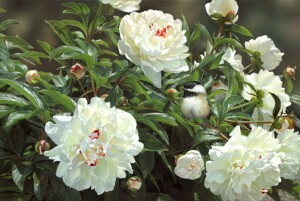 June Peonies has been selected for the Birds in Art tour to the Museum of York County, Rock Hill, South Carolina (December 17, 2016 ­– April 9, 2017); Wichita Falls Museum of Art, Midwestern State University, Wichita Falls, Texas (April 28 – June 25, 2017); Roger Tory Peterson Institute of Natural History, Jamestown, New York (July 15 – August 27, 2017); Rockport Center for the Arts, Rockport, Texas (September 15 – November 18, 2017); and Fullerton Arboretum, Fullerton, California (December 8, 2017 – January 25, 2018). This entry was posted in chickadee, Competition winner, New original.